TARRC were pleased to exhibit for the first time at AUTOPROMOTEC 2013, Bologna, Italy, from 22nd May- 26th May 2013. Exhibiting as 'Malaysian Rubber Automotive Products' and based in Hall 18, which is for spare parts and components, stand D41 was well placed to receive interest from the Italian and other European visitors. The 2013 exhibition was characterised by a high number of exhibitors (1,512, of which 39% from 52 different foreign countries), a large covered area (a total of 156,000 square metres, of which 20,000 outdoors) and a high visitor turnout (102,536 in total, of which 83,594 from Italy and 18,942 from abroad). From the 2011 exhibition there was a significant increase (+ 2.2%) in the number of foreign visitors. A spokesperson for the exhibition stated, "Autopromotec 2013 was a great success. In the future, the partnership between BolognaFiere and Autopromotec will continue to act as an international platform and meeting hub for Asian, European and American market players, as shown by the higher number of foreign operators attending Autopromotec 2013". The next Autopromotec will take place at Bologna’s exhibition centre from 20th - 24thMay 2015. 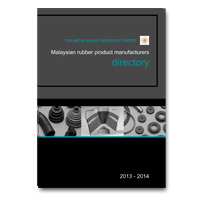 If you are looking to source high quality, competitively-priced rubber-based products and were unable to make it to the exhibition, then just let us know and we can send you your FREE 2013 Directory of Malaysian automotive product exporters of parts, components and materials suppliers.